I meant to stay two days; stayed five. 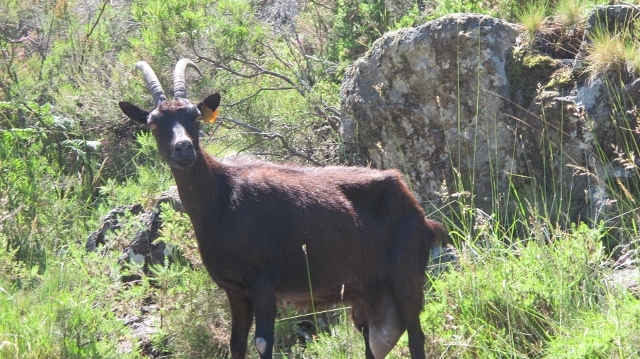 After a train to Braga (hour and half) then a bus (total about 10 euros), that weaved back and forth up and up the mountain–stopping at every store to drop off groceries etc– I finally made it to the lush town of Campo do Geres (Gee-resh). Green and fresh, it rains here more than anywhere else in Portugal. On the first day I rented a bike from the bike shop Geresmont (17 euros half day–too expensive in my opinion). 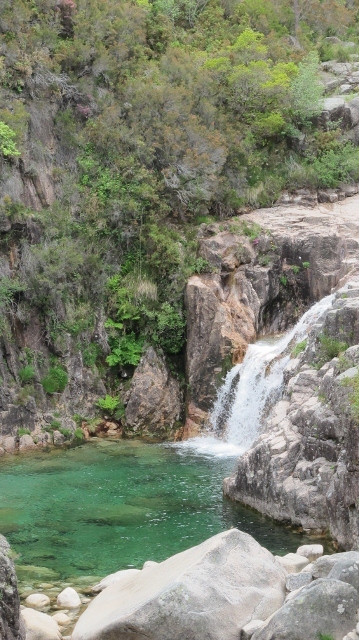 Anywho, rode six kms straight up, through the park, almost to the Spanish border to see a set of waterfalls and pools called Portela do Homem. 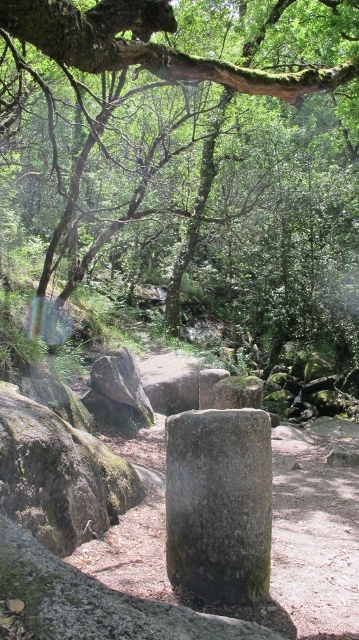 If you head back on the same road, west, to the right, ride the old Roman road that follows the Homem River– Milha. Yes, Romans were here, too. What is left are these Roman-like columns on a dirt forest road. 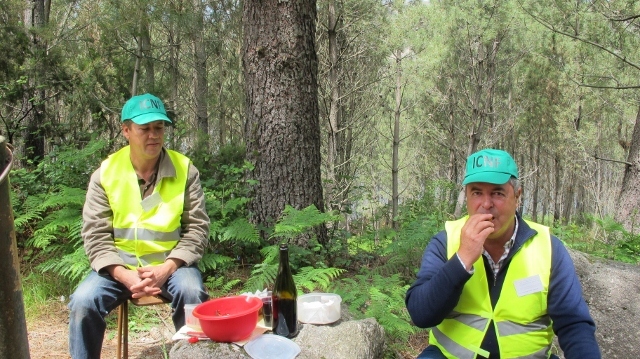 Construction crew having a break drinking vino verde–wine made with green grapes. I love it. Taking their time–as it should be. 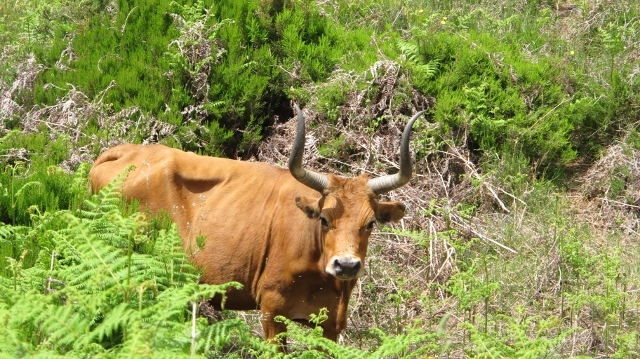 Accommodation note: stay at a family home such as AL Vidoeiro about a kilometer up the road (17 euros a night) verses in town at the hotels (about 55 or more a night). Judith and her family took me to the Spanish border one night at the thermal hot pools in a town called Lovios… amazing after a long ride. 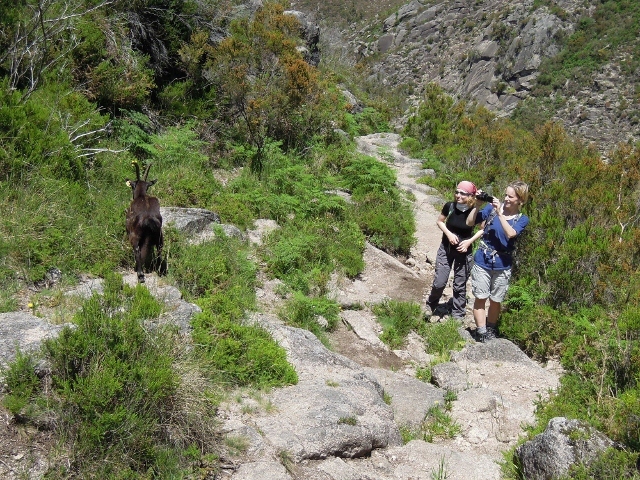 The area is also has well-marked hiking trails–nothing too strenuous. 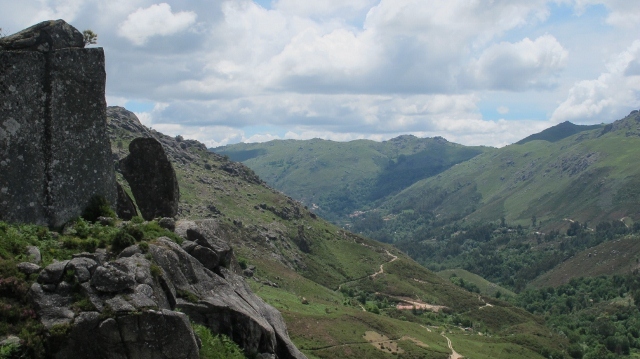 The steepest is Cidade da Calcedonia (marked P1); at the peak it is 850 metres (four hours slow hike). This is where I met Gabi and Martin from Prague. Wonderful hiking companions. We drank a cold Super Bock beer immediately after then cleaned up and went for cod supper! 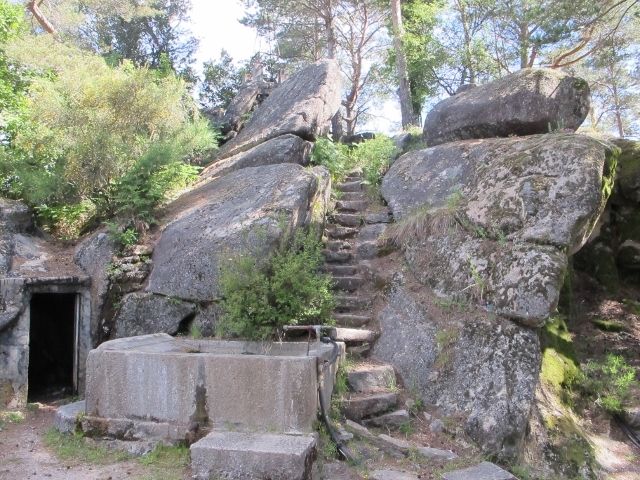 Next day biked again straight up then followed signs to Pedra Bela to see a panoramic view and amazing forest — complete with steps! 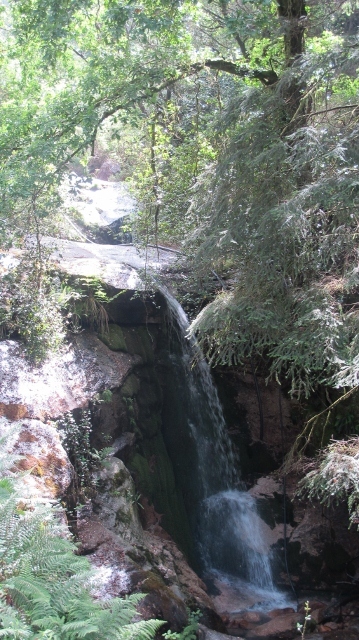 After Pedra Bello, I headed down, fast, to Ermind, to find more waterfalls and pools. 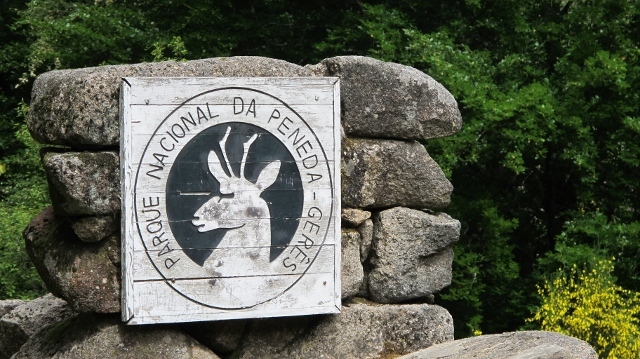 The road then loops back into Campo do Geres.